London food has moved on so much in the last 20 years and I truly think that our restaurants rival the best in the world. Our Gastropubs are fantastic, we have some of the best farmer’s markets and trendy street food stalls, the authenticity of the ethnic food available is unsurpassed, and the popup scene is first-rate. When you’re in the mood for a good meal, you can’t do much better than London. Yes, living in London I thought I had it all… until I went to San Sebastian. Now, I can never look at another pint of lager and a packet of crisps again without feeling slight pangs of depression. We may have the world beaten on meals but when it comes to grazing, nobody does it better than Spain. 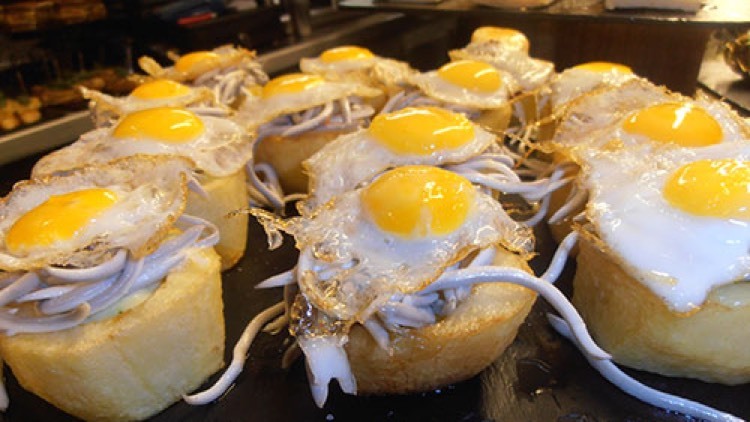 We know them as Tapas, but in the Basque area of northern Spain, they seem to all call them Pintxos or Pinchos. Pincho literally means ‘thorn’ or ‘spike’ and refers to a small snack that is usually secured to a piece of bread with a toothpick. The name Tapas comes from the Spanish word Tapar, which means ‘to cover’. The original concept was that you would have a piece of bread or cured meat to cover your glass and keep out insects or other debris. There are all kinds of different stories about their history and how long they’ve been around. Some say they started in the 13th century, others say the 16th century. What is undeniable is that they’ve evolved over the centuries, influenced by the cultures that Spain came into contact with over the years, and now they are often more important than the drink. Albondingas (meatballs), Croquetas with ham, cheese or mushrooms, Squid and Octopus in batter, ink or just grilled, Chorizo, Gambas (shrimp), Tortillas, Peppers, Olives, Cheeses, Foie Gras, Scallops, Bacalao (salt cod), Crab, Monkfish, and the list goes on, and on, and on. The variety is simply astounding and the quality is unquestionable. Having tried over 60 dishes in just 4 days, it’s just too much to list. Standout dishes were prawns wrapped in potato string and deep fried, sirloin of Galicean grass fed beef from cattle that are a minimum of 6 years old, beautiful pan fried ceps with garlic and butter, a place that did nose to tail pork where we had ears, belly, and feet, and a crustless baked cheesecake that rivalled the best I’ve had in New York. There’s one place that is really pushing the frontiers of innovation, playing with their food and taking it to a 3 star, Heston-like level. Zeruko is a multi-award winning taverna and Head chef Jose Antonio Calvo creates some unique stunners that are not just gimmicks, but taste as good as they look. La Hoguera (the bonfire) is a small casserole dish topped with a metallic grid with a slice of cod infused by a smoking rosemary charcoal briquette, once you’ve grilled it long enough, you put it on a crouton with a herb and onion cream and chase with a sip of salad water in a test tube. The lobster rose is a lobster in small bowl of made of dehydrated raspberry jam, served on a herb crouton resting on a shot glass filled with dry ice and rose water. Zeruko is not to be missed. It’s not just the food that makes San Sebastian so special, or the fantastic wines. It’s the way of life. Here you find a tourist destination that does not cheat visitors with contrived decorations, higher prices or lower quality. It invites you in to eat and drink amongst the locals. Older generations mix with the young. Groups of fun having singletons sit alongside intimate couples. You don’t see people having copious amounts to drink with pints and wine glasses that are one third the size of a bottle. Instead, they drink small glasses of wine and half pints of beer, interspersing it with food and conversation as they meander through the quaint little streets. The food is fresh and the people serving it are proud of what they do. There is an energy and a buzz that is almost as intoxicating as the wine. Whether you’re a foodie, a traveller or just someone that loves going out and socialising, I can’t recommend San Sebastian highly enough. You’ll never see a pub crawl the same way again.